What's has a 14,000-ton capacity, is 618' long, 62' wide, and 32' deep? If you said the Steamship William G. Mather you are right! 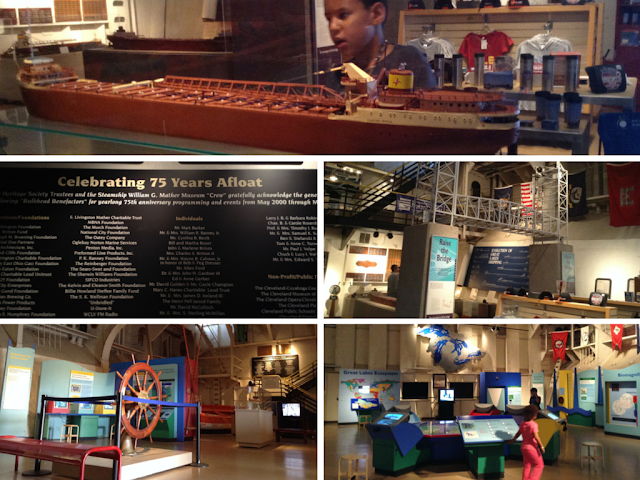 Originally located on the East Ninth Street Pier when it opened as a museum in May 1991, the Mather is now located at Dock 32, just west of the East Ninth Street Pier north of the Great Lakes Science Center. 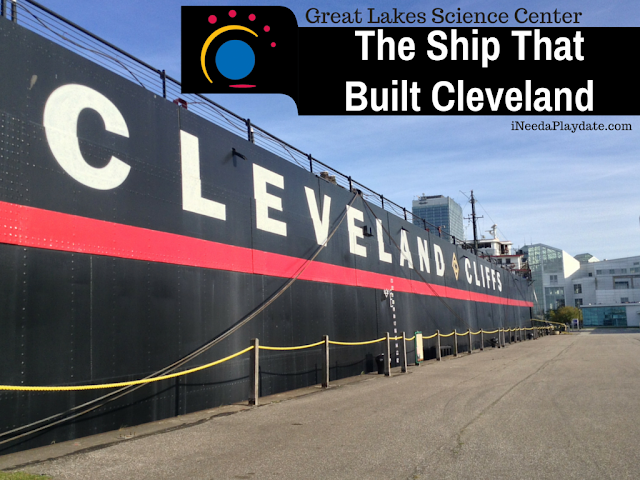 We were recently invited by the Great Lakes Science Center to tour the Mather and I must admit, I never really wanted to go on this ship. Curious - absolutely and the kids have and have begged to go on, but I just imagined it being dark and uninteresting. I was so wrong! The entire time I wondered why the heck had I not come sooner! This is truly a piece of Cleveland history that is beautifully restored with a stunning view of the Cleveland skyline. 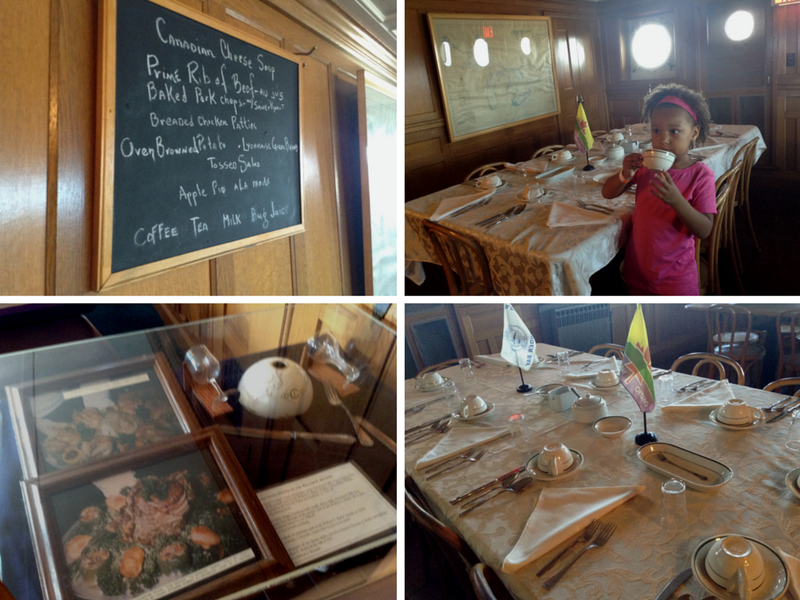 There was no official tour when we went, but there were plenty of people on hand to explain where we were and the history of the ship. Between GLSC's website and the tour, I learned a lot. I need to go back to a guided tour or better yet, a hard hat tour and really see the belly of this amazing ship! Steamship William G. Mather was named for William Gwinn Mather president of Cleveland-Cliffs Company in 1925 when the ship was built in Michigan. At the time, she was considered the flagship of The Cleveland-Cliffs Steamship Company fleet because of her innovative design, propulsion, navigation equipment, and crew accommodations. The Mather was also known for her elegant guest rooms. The Mather had a distinguished 55-year career (1925-1980) as a Great Lakes freighter before being forced into retirement in favor of larger, self-loading ships. But, this ship had many firsts - the longest when built, the installation of radar in 1946, one of the first Great Lakes vessels to do so, and in 1964, became the first American vessel to have an automated boiler system. The Mather also set a record for the first arrival in a Northern port as she lead 13 freighters in 1941 through frozen waters to Duluth, Minnesota to get steel to the Allies during WWII. Cleveland-Cliffs Inc. donated the Steamship William G. Mather to the Great Lakes Historical Society in 1987 to be restored and preserved as a museum ship and floating maritime museum. Over the next several years, the Mather changed ownership a few times and was eventually restored to what it is now with over $2,500,000 and 250,000 volunteer hours invested. It's currently owned and curated by the Great Lakes Science Center and is open May to October. 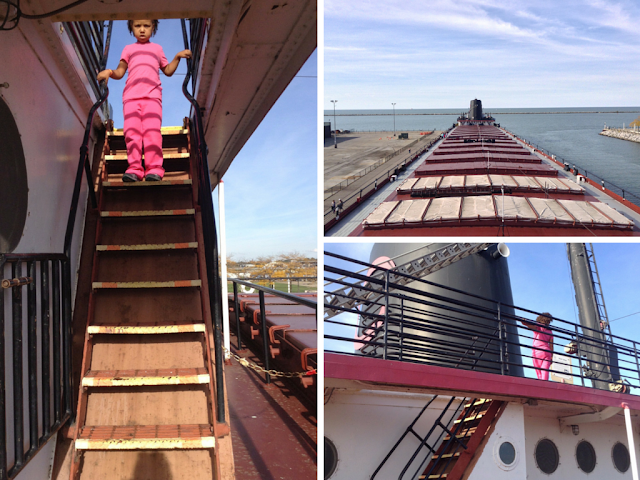 Tour this restored 618-foot historic flagship and see what life was like onboard a working Great Lakes freighter. Explore the 1925-built Mather from stem to stern and see its huge cargo holds, brass and oak pilot house, elegant guest quarters and four-story engine room. Walk the decks and marvel at the “engineering firsts” that helped transform Northeast Ohio into a great industrial center. Experience the golden era of steamboats on one of the best. 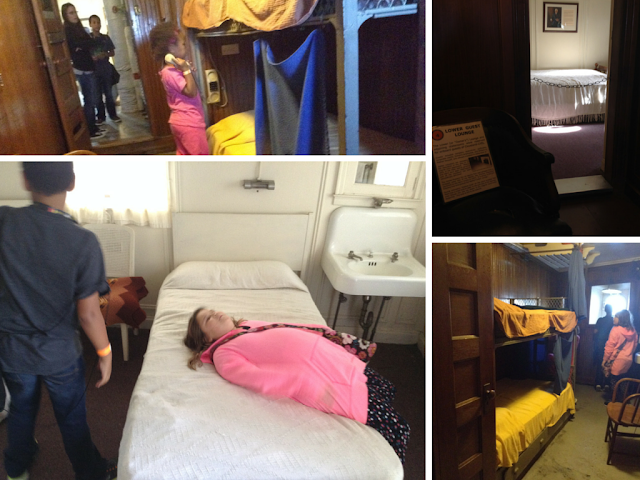 The kids loved imagining that they worked in the engine room or were staying in one of the rooms. It truly is one of the neatest museums that I've been to and lucky to have it here in Cleveland. 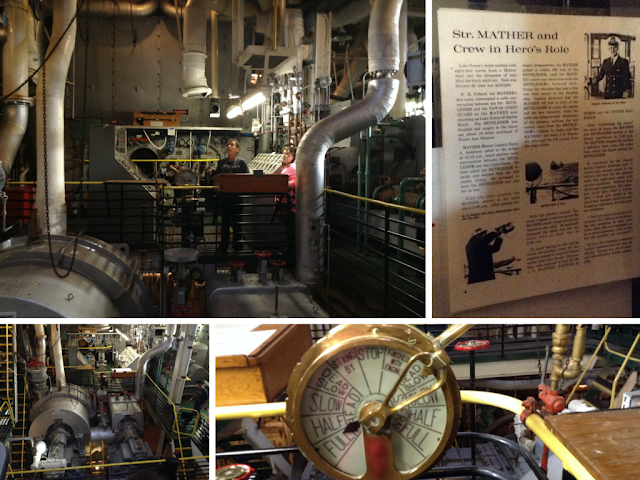 There are only a three weekends to check out the Steamship William G. Mather until May 2016 and I highly recommend it! Check out our MathAlive Adventure plus a chance to win four tickets to the Great Lakes Science Center!